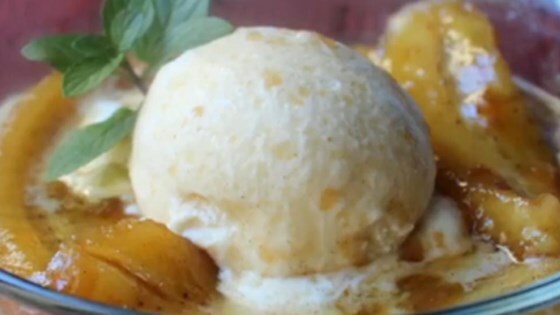 "When you think show-stopping, special occasion desserts, you usually don't think simple-and-fast, but that's the case with bananas Foster. This delicious New Orleans classic only has a few ingredients, and takes just minutes to make. Except for the folks that burn their houses down, everybody loves this recipe." Melt butter and brown sugar together in a skillet over medium-high heat until butter melts and mixture begins to bubble, 3 to 5 minutes. Place bananas, cut-side down, in brown sugar mixture. Cook until just golden, about 30 seconds; flip and cook until golden on the other side, about 30 seconds. Remove from heat. Pour rum and banana liqueur into skillet; return skillet to high heat. Cook until alcohol ignites and flames, 1 to 3 minutes; add cinnamon. When flames die, remove skillet from heat. Scoop vanilla ice cream into 2 bowls. Divide bananas mixture between bowls and garnish with mint sprigs. See how to make this surprisingly easy, show-stopping dessert. Absolutely wonderful. Didn't change a thing! Great recipe! Made without changes. Was great with Blue Bell vanilla bean vanilla. Great recipe. . My wife said it was one of the best desserts she has ever tasted. I left out the banana liqueur. Thanks Chef John.